Located right beside KB mall & KB Cyber Plaza. 1KM to Gelanggang Seni (Culture Centre) and Stadium Sultan Muhammad Ke-IV. 2 KM Pasar Siti Khadijah. 40 KM to Rantau Panjang duty free shopping area. Habib Hotel set in the heart of Kota Bharu, is a great choice for business and leisure travellers. Offering guests convenience, comfort and service which is second to none. Habib Hotel is surrounded by the city’s most popular shopping areas as well as the Muzium Negeri. Government offices which are all within walking distance, are the High Court, MARA, MPKB, Jabatan Pelajaran, Lembaga Tabung Haji, the Sultan Mohammad IV football stadium and is only 20 minutes from the Kota Bharu airport. RIDEL HOTEL is located at blok A, next to Pelangi Mall shopping complex, facing Sungai Kelantan. Surrounding by Kelantan Heritage and attraction at five to ten minutes walking distance includes Masjid Muhammadi, Padang Merdeka, War Museum, Islamic Museum, Istana Jahar, Istana batu, royal museum, Kampung Kraftangan, Kota Sultan Ismail. Welcome to New Pacific Hotel, the newest 3-star hotel in the state of Kelantan, we invite you to sample our traditional Kelantanese hospitality. The New Pacific Hotel has 219 rooms and suites. All of our rooms are tastefully furnished with a blend of modern and traditional touches. Each room is provided with air conditioning, television, astro, radio, in-house movie, tea and coffee making facilities, mini bar and IDD calls. We also provide a wide range of business and leisure facilities and other amenities. The Grand Riverview Hotel is centrally located in Kota Bharu the capital city of Kelantan Darul Naim. The state is a unique travel destination known for its splendid beaches, rich cultural, ornate handicrafts and wood carvings. The hotel is situated along the Kelantan River and is within walking distance to business, shopping and cultural zone ideal for business and leisure travelers. You will also find batik and songket fabrics are among the best in the country. The laid-back atmosphere, rustic charms and friendly locals add to Kelantan’s appeal. Telefon : 09-7472246 Fax : 09-7461122 Experience the rich Malay culture at Renaissance Kota Bharu Hotel, the city’s only five star international class hotel and premier convention and wedding venue. Conveniently located in the heart of Kota Bharu’s commercial and shopping district and also close to the domestic airport. For business or leisure traveler, the 298 spacious accommodation rooms and suites provides world class service and facilities including High Speed Internet, 2 Executive Floors with dedicated Club Lounge,Business Centre, wireless meeting rooms with Grand Ballroom, an on-site event management to create exhibitions,conventions, meetings and most extravagant weddings. The Renaissance Fitness Centre is Kota Bharu’s largest gymnasium equipped with latest fitness equipment,steam rooms,sauna, Jacuzzi and a heated outdoor swimming pool. Hotel Perdana is Kelantan’s best known premier hotel with 4-star facilities that offer the very best of both worlds: business and pleasure.Strategically located in the heart of town, Hotel Perdana stands just next to the State Cultural Center and Sultan Muhammad IV Stadium and easily accessible within and outside Kota Bharu town limit. A leisurely 45 minutes drive leads you to the border of Thailand. Hotel Raudah Kota Bharu Kelantan – Hotel Murah dan Selesa di pusat bandar Kota Bharu, Kelantan. Terletak berhampiran dengan stesen teksi/bas, Kota Bharu Trade Centre (KBTC), Pasar Besar Siti Khadijah, Bazar Buluh Kubu, Mcdonalds 24 jam, Pizza Hut, Giant, Parkson, TM Point, Kelantan Trade Centre (KTC), Wisma Persekutuan, Stadium Sultan Muhammad IV, Muzium Negeri Kelantan dan lain-lain. Suria Hotel Kota Bharu in Kelantan, Malaysia is a 2-star hotel located in the heart of Kota Bharu. Located in the central business, shopping and entertainment district, the Suria Hotel Kota Bharu in the East Coast of Peninsular Malaysia is convenient and within walking distance to the shopping districts, night food market and also public transport. Located near Kota Bharu’s Langgar Bus Terminal, the Suria Hotel is only two minutes walking distance for those arriving by coach to Kelantan- the Cradle of Malay Culture. The Suria Hotel is a budget hotel for the budget travelers seeking adventure in the Kota Bharu. The Suria Hotel Kota Bharu offers comfortable accommodation to its guest at a low price. Alamat : PT 60-64, Jalan Pintu Pong, Kota Bharu, Kelantan. JL FARA HOTEL ini direka dengan sentuhan Gaya Hidup Malaysia dengan perpaduan teknologi kontemporari moden untuk memberikan suasana yang menyenangkan baik untuk pelancong perniagaan mahupun rekreasi. Semua bilik kami dilengkapi dengan bilik mandi, TV satelit, AC, mandi air panas dan broadband internet akses WiFi. Datanglah ke sini secara bersendirian, bersama keluarga ataupun rakan-rakan untuk menikmati penginapan yang memuaskan serta berpatutan dan rasailah sendiri pengalaman anda di hotel JL FARA. Hotel Politan is a clean, convenient & cozy budget hotel in heart of Kota Bharu, Kelantan. 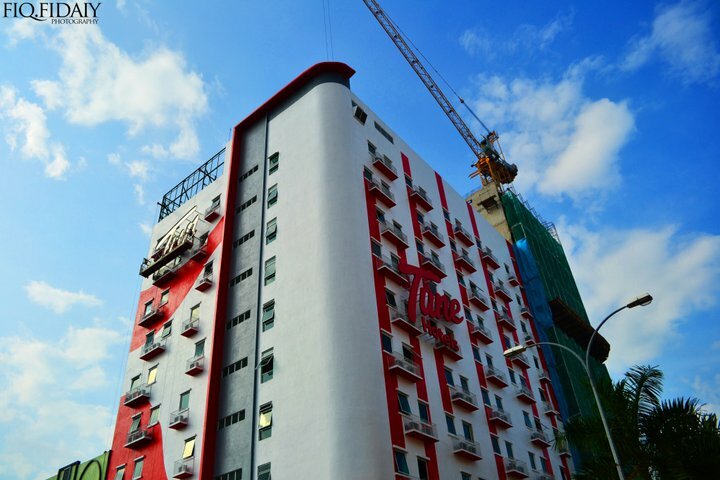 One Station Hotel is a brand new hotel in the heart of Kota Bharu, Kelantan. With its modern design and luxury facilities, it is now the first choice for most travelers.One Station hotel is offering a cheap yet chic hotel. Pure geometric lines, highlighted colours on white backgrounds, lighting effects creating a great atmosphere. Ever floor has its own colour, every room has its own aura…. The rooms set the tone – fabrics with bright, colorful touches and bathroom adorned with soft lighting and dazzling mosaics. Our 5 star amenities surely will make you enjoy your stay with us.All rooms are fully air conditional with kettle, Wifi, LCD TV (first in Kelantan), Astro channels and so much more. One Station Hotel is located beside Tesco Kota Bharu. Located in the new commercial area of Wakaf Che Yeh, Hotel & Suites Kota Bharu offers 108 rooms with modern and comfortable facilities. This 4 star hotel is only 20 minutes away from Sultan Ismail Petra airport, 10 minutes from Kota Bharu town and Kubang Kerian Wakaf Che Yeh, known for its lively and bustling all night bazaar, is just a quick walking distance away. Untuk senarai Resort sila klik pada Senarai Resort di Kelantan. ejoe akman adalah founder ejoeSolutions. Berpengalaman lebih 10 tahun dalam bidang pembangunan web & pembangunan sistem online menggunakan PHP & MySQL. Hotel in Kota Bharu…looking for one. apa kata letak koordinat gps..nanti senang nak rujuk..nak add dalam garmin pun senang. authoring on other websites? I have a blog centered on the same information you discuss and would really like to have you share some stories/information.